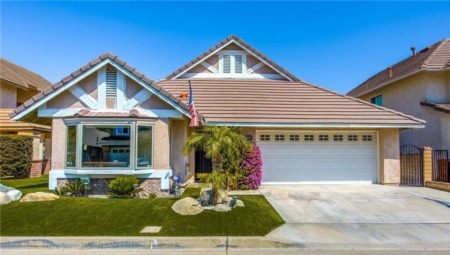 Beautiful, Remodeled Garden Grove Home Expanded in 2008. Featuring High Ceilings and a Skylights, 5 bedrooms, 4 baths, 2 car garage, 2262 sqft of living space and an 8,255 sqft lot. The construction of the Home can easily accommodate 2 Families with its separate entries. Glass Wooden Door opens to the Living Room with a cozy Fireplace, custom Plantation Shutters, exquisite Laminated Wood flooring and Recessed Lighting thoughout, which leads into a spacious Gourmet Kitchen with Double Ovens, Stainless Steel Appliances and Custom Cabinetry. Spectacular Granite Counter Tops and a Center Island with a 5 Burner Gas Cook Top. Central Air Conditioning. The sizable Family Room is perfect for gatherings and entertaining. Magnificent upgraded Baths with elegant backsplash and titled walls, designer glass Shower Doors and marble Vanity Sinks. This large cul-de-sac, corner lot Home has RV parking, Fenced front and back yard for privacy and curb appeal. Close to Authentic Restaurants, Shopping Centers, Supermarkets, Multi-Grade Level Schools and Freeways. This Home is highly desirable and rarely on the market, perfectly suitable for a large family. SchoolsClick map icons below to view information for schools near 12401 Trask Avenue Garden Grove, CA 92843. Listing provided courtesy of Sharon Tran, First Team Real Estate.